Publications - I enjoy reviewing new nursing textbooks. I have worked with Pearson Education and F.A. Davis Company in this capacity. 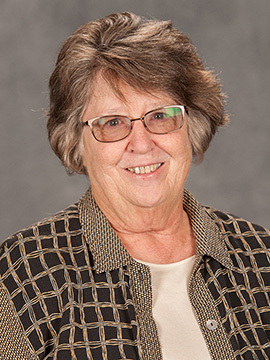 "I truly enjoy being a faculty member in the nursing program. We have the opportunity to work together as we learn to know each student and to participate in the student's education. Hesston College is a great place to develop the skills, knowledge, and attitudes that are vital for caring for others. "My hope is that students can relate to a great variety of people; that they can provide the encouragement and care that each person's needs. One of my joys as a teacher is to see Hesston College graduates working as effective and skilled registered nurses." How did you choose to study nursing? After I worked as a nurse aide in high school, I began to be interested in nursing. I wasn't sure what area I wanted to study in college but I decided on nursing from among English, home economics and nursing. Even then teaching seemed to be a big interest for me. I like to teach classes that also have hospital clinical experience with the classroom learning. Mental Health Nursing is one of my favorites. Teaching students in the clinical area gives the opportunity to teach and to learn to know the students as individuals. How does your background and educational experience shape your teaching at Hesston? Early in my career I worked for five years as a nurse in various clinical settings. I enjoyed being a nurse but I experienced a renewed sense of profession when I began teaching nursing. Studying for a master in nursing and taking post-graduate courses at Wichita State University during a sabbatical gave me new knowledge and inspiration for nursing and nursing education. Who are your role models or mentors? How have they influenced you? I had several teachers at Goshen (Ind.) College who took the time to find out my strengths and then helped me build on my abilities. Because of them, I learned to build relationships with students and help each student to develop abilities to become a great nurse. Their interests and experiences. What inspires them to their interest in a career in nursing? How do you connect with students in the program? I like to interact with students outside of class, in the hallway, to ask about their lives and interests. My office door is usually open and I am available for students to come in and talk. What do prospective students need to know about Hesston’s learning environment? The faculty and staff are supportive of students at Hesston College. We want to assist them to learn and to grow in knowledge, abilities, and attitudes. Becoming acquainted and working alongside other students is a bonus for nursing students. The nursing faculty want to assist students to become great nurses. Where do alumni go and what do they do after Hesston? Most nursing students begin working in hospitals or clinics as registered nurses. Students continue to study for bachelor's degrees in nursing or further degrees after they leave Hesston College.